The Roll-CIT™ from Environ® marketed for the treatment of Medical Skin Needling is the patent pending creation of Dr Des Fernandes, a South African Plastic Surgeon. Its name emanates from the abbreviation for Collagen Induction Therapy - CIT and is pronounced “Roll Kit”. It is aimed at stimulating the body’s own collagen production to reduce the appearance of fine lines and wrinkles, stretch marks, skin laxity and scarring by introducing a series of fine, sharp needles into the skin. The needles are attached to a single use, sterile roller which is moved over the surface of the skin to create many microscopic channels or columns at various depths of penetration. This “damage” to the dermis encourages the body to produce more new collagen and elastin which generate new skin cells to literally “repair” itself, thus the skin becomes thicker, plumper and more youthful. Dr Des Fernandes conceived his original needling device over a decade ago; a small needle stamp to induce collagen formation and used it as a regular treatment in his surgical practice. He delivered his first clinical paper on skin needling of the upper lips to the International Society of Aesthetic Plastic Surgery (ISAPS) congress in 1996. Since then he has gone on to develop a needle roller through his associated companies and published a paper on his method of minimally invasive Percutaneous Collagen Induction (PCI) in 2005. It is available in a Cosmetic model which has a penetration depth of between 0.02 – 0.2mm, and in a Medical model with a needle length of 1mm, as well as a Surgical model with a 3mm needle length for more aggressive, professional treatments. The manufacturers claim that the principle behind the Environ Cosmetic Roll-CIT™ is that it helps to increase penetration of active ingredients into the skin by breaching the horny layer (surface) through the creation of micro-channels. This allows vitamins A, C, E and beta-carotene contained in their adjunctive skincare products to reach into the depths of the skin, about 10,000 times more effectively than by simply applying the products to the skin’s surface. This targeted penetration of vitamins into the lower layers of the skin will thus assist collagen formation. This personal use roller is targeted to restore skin tightness in early skin ageing, thicken thin skin, smooth fine lines and wrinkles, soften minor scars and reduce thread veins. It is not suitable for use by those persons with active acne, eczema, rosacea, psoriasis or raised moles or warts. Due to the gentle nature of this particular roller, it can be used anywhere from twice a week to daily, depending on the results desired. The Medical Roll-CIT™ is designed for professional use by trained doctors, surgeons, nurses and aestheticians and is aimed at treating acne scarring, fine lines and wrinkles and the restoration of skin tightness. The Surgical Roll-CIT™ must be used by a trained surgeon. It is a one-off treatment with significantly deeper penetration than the Medical-Roll-CIT™ and is even more effective at softening deep lines and wrinkles and at reducing burn scarring, keloid (raised) scarring and pigmentation marks. Skin redness for a couple of hours following treatment, much like a sunburn, with some minor bleeding and bruising possible. Skin may also feel warm, tight and itchy for a short while. This should normally resolve in 12 - 48 hours. Side effects or risks are minimal with this type of treatment and typically include minor flaking or dryness of the skin, with scab formation in rare cases. Milia (small white spots) may also form on the skin which can be removed by the practitioner. Hyperpigmentation (darkening of certain areas of the skin) can occur very rarely and usually resolves after a month. If you have a history of cold sores, this could possibly flare up after treatment. In 2008 Dr Des Fernandes published a retrospective analysis*, in conjunction with some German colleagues, looking at 480 patients with fine wrinkles, lax skin, scarring and stretch marks treated with percutaneous collagen induction using the Medical Roll-CIT™. Most patients had only one treatment, but some had as many as four. They had all been prepared with topical vitamin A and C creams four weeks preoperatively. Results showed that patients rated their improvement at between 60 and 80% better than before treatment. Histological examinations were carried out in 20 patients and showed a considerable increase in collagen and elastin deposition at 6 months postoperatively. The epidermis demonstrated 40% thickening of stratum spinosum and normal rete ridges at 1 year postoperatively. * Percutaneous Collagen Induction Therapy: An Alternative Treatment for Scars, Wrinkles, and Skin Laxity. Plast Reconstr Surg. 2008 Apr. Matthias C. Aust, Des Fernandes, Perikles Kolokythas, Hilton M. Kaplan, Peter M. Vogt. Hannover, Germany; Cape Town, South Africa; and Los Angeles, California. 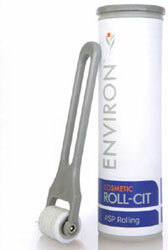 The retail price for the Cosmetic Roll-CIT™ is approximately £60.00. A programme of in-clinic treatments with either the Medical or the Cosmetic Roll-CIT™ starts from around £395.00. Click for ALL Roll-CIT™ clinics in the UK & Ireland registered and verified by Consulting Room.